An initially very clear evening today allowed observations again. Lacrosse 3 (97-064A) was captured, along with NOSS 2-3D (96-029D) and the NOSS 3-4 duo (07-027A & C). 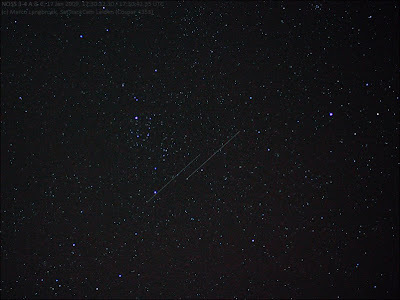 USA 32 (88-078A) was captured as a very faint trail but not measured. A mistake of one minute in the timing while trying to photograph the 96-029 objects made me miss the C & E objects, but captured the D object at the end of what seems to be a slow flare.